This week Just Asia begins with Indonesia, where the Corruption Eradication Commission arrested Bekasi’s Regent, Mrs. Neneng Hassanah Yasin on Sunday. She was arrested together with 10 other persons including government officials and employees of the Lippo Group. The Lippo Group apparently agreed to provide 13 billion rupiah for the Regent and her officials in order to obtain permits for the Company’s mega project Meikarta. Next, Pakistani authorities detained Gulalai Ismail, a Pashtun human rights defender, on her arrival at Islamabad airport last Friday. She was told that her name had been placed on the “Exit Control List”, banning her from traveling outside the country. She was later released, due to huge social outcry. India’s Minister of State for External Affairs, MJ Akbar, has been accused of sexual harassment and sexual assault by several women. The revelations and accusations came as part of the #MeToo movement that has engulfed India, starting with allegations against a Bollywood actor. MJ Akbar has refused to resign from his post as Minister and has instead filed a criminal defamation suit against Priya Ramani, one of the women accusing him. Moving to Burma, police arrested three journalists last Wednesday after their paper criticized the financial management of Yangon’s government, overseen by a protege of leader Aung San Suu Kyi. Executive editors Kyaw Zaw Lin and Nayi Min, and chief reporter Phyo Wai Win were taken to court in handcuffs to hear the charges against them. They were then taken to Insein prison. The trio could be fined and jailed for up to two years if a court rules that their story was published with intent to cause “fear or alarm to the public”. In Thailand, a new report documenting 10 years of alleged abuses against a mining-affected community in Loei province was issued earlier this month by Fortify Rights, a Swiss-American NGO based in Thailand. The 90-page report notes that reprisals include judicial harassment, arbitrary detention, death threats, and violations of the rights to freedom of expression, peaceful assembly and a healthy environment. Lastly, Bangladesh President Abdul Hamid approved a controversial new digital security law early last week. The Digital Security Act combines the colonial-era Official Secrets Act with new measures empowering police to make arrests without a warrant. It replaces Bangladesh’s Information and Communication Technology Act, which was also heavily criticized by journalists and human rights groups. 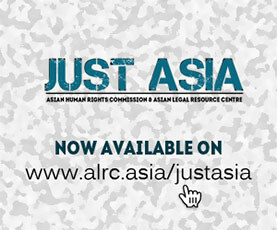 The bulletin can be watched online at www.alrc.asia/justasia and AHRC TV YouTube. We welcome both human rights feeds to be considered for weekly news bulletin, and your suggestions to improve our news channel. Please write to news@ahrc.asia. You can also watch our Weekly Roundup on Facebook.